I'm a big fan of portable sewing machines. They're just so cute! And while there's no shortage of information on Singer Featherweights and their various models, there's hardly any information out there on other vintage portables. 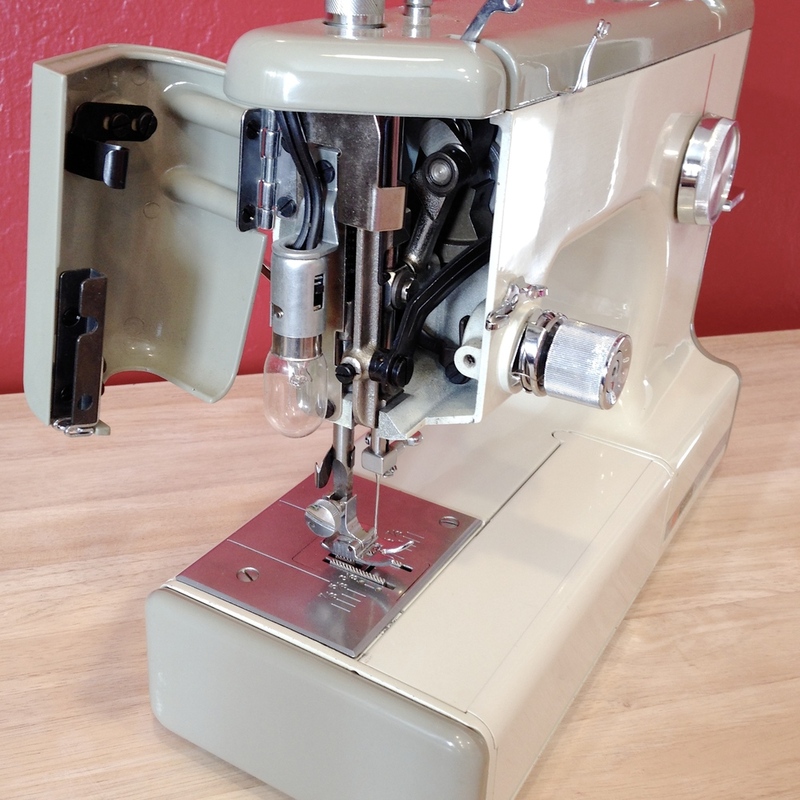 When I first started getting into vintage machines, I largely dismissed Kenmores as the red-headed step children of the sewing machine world. My dismissal was largely one made in ignorance, as I've found the Kenmores to be fantastically feature rich compared to their utilitarian Singer counterparts. Meet the Kenmore 158.1040. This is a Japanese-made 3/4 size ortable machine that weights in at about 17 lbs--just slightly heavier than a Featherweight plus its case. Perhaps the most distinguishing feature of the machine is its removable accessory case and extension tray. It's almost like a transformer! There are quite a few models in the 1040 series. Six in all: 1020, 1030, 1040, 1045, 1050, and 1060. The 1040 comes in a cream color with green accents and is the most commonly found. The 1040s were built in the early 70s. I'll do a comparison of the models in a future post. It sports a number of utility stitches including zigzag, blind hem, multi-step zigzag, stretch stitch (straight and zigzag) as well as a 4 step button hole. The build quality is exceptional. The machine is all-metal with the exception of the plastic chrome stitch length and width dial, tension dial, hand wheel, race cover latches and accessory tray. As you can see from the pictures below, there's a lot of stuff crammed into a very tiny space. The left picture shows the machine with the top off where you can see the 'brain' of the machine. Yup, it's all metal in there. I've disassembled the brain before and don't ever plan on doing that again as it was very difficult to put back together! It features a front loading, oscillating hook and is zippy--capable of exceeding 1000 stitches per minute. Not bad for a portable! It also has the ability to drop the feed dogs. The motors on these seem to vary from 0.8 to 1.0 amp and uses a double pulley mechanism. Another cool feature of these Kenmores is the extra high presser foot lift. I've got 5 quarters under that foot comfortably and can squeeze in another dime which is an incredible amount of lift--comparable to my industrial Pfaff 138. Obviously, you can't sew that much material at once, but the extra lift really helps. The Kenmores come with a set of four buttonhole guides which makes using the 4 step buttonhole feature a snap (once you match the stitch lengths). Also included is a plastic zipper foot, an edge stitcher with holder, straight stitch foot with matching needle plate, a Kenmore branded screw driver and seam ripper. My favorite feature is the quick change straight stitch to zigzag needle plate that is common in many of the Kenmore 158 models. I believe the 1030 requires the entire needle plate to be unscrewed off to be changed. The quick change mechanism is available on models 1040 on up and is accessed by pushing a tab up from under the needle plate. Lastly, the machine comes in a cute (or gaudy, depending on your aesthetic) rose embossed case. Honestly, this is more hassle than it's worth, as getting the machine into the case is no small feat! There are two minor quibbles I have with the machine. The needle position is fixed in the center. From what I've read, this was a cost cutting effort on Kenmore zigzag machines. It's not a big deal, but on a zigzag machine, I'd like to see multiple needle position settings. Second, the machine sports a fixed reverse stitch length. When making button holes, you can adjust the stitch length density going forward but the reverse is fixed, so you need to manually match the lengths to get a perfect button hole. I find this to be very odd, as the machine is capable of doing stretch zigzag stitches which requires matched forward and reverse lengths. There you have it. The Kenmore 158.1040. A real workhorse of a portable machine!